This funeral hatchment is mounted on the south wall of St Swithun’s church. It commemorates George Nevill, 1st Earl and 15th Baron of Abergavenny, who died in 1785, aged 58, and his wife, Henrietta Nevill, nee Pelham, who predeceased him and died in 1768, aged 38. The hatchment would have been displayed at the funeral of the Earl, and afterwards at his home, Kidbrooke. The hatchment shows the Nevill coat of arms on the left hand side as you look at it, and the Pelham coat of arms on the right hand side as you look at it. The birds probably represent pelicans as a pun on the Pelham name. On the Nevill side is a rose, similar to the red rose of Lancaster. This branch of the Nevill family descended from Ralph, 1st Earl of Westmorland and his second wife, Joan Beaufort, who had 14 children, one of whom, Sir Edward Nevill, was the 7th son of the Earl of Westmorland. This rose symbol is a mark of cadency, indicating a 7th son, so it represents the descent of this branch of the family from the 7th son of Ralph, Earl of Westmorland. Joan Beaufort was the daughter of John of Gaunt, Duke of Lancaster and his mistress, Katherine Swynford. Towards the end of his life, John of Gaunt married his mistress and their 4 Beaufort children were legitimized. Joan Beaufort is buried in Lincoln cathedral, next to her mother, Katherine. Joan’s effigy in brass is in St Mary’s church, Staindrop, Durham, with that of her husband and his first wife. 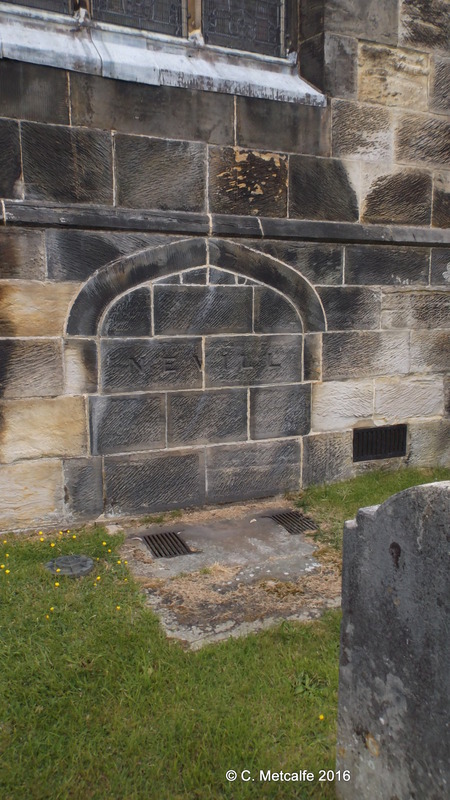 The heraldry of the Beaufort family included a portcullis. On this hatchment, there is a portcullis, which could signify the Beaufort lineage, or the Houses of Parliament at Westminster. However, confusingly, it is on the lady’s side of the hatchment. It matches the red rose mark of cadency on the Nevill side, artistically, but in terms of heraldry, I think that it is on the wrong side. The motto ‘Ne vil velis’, literally means ‘Form no mean wish’, but it is a pun on the Nevill family name. There is another Nevill monument in St Swithun’s church, in the memorial chapel, to William Nevill, Lord Abergavenny and the founder of Kidbrooke in 1735. He died in 1744, aged 47. This monument is believed to be the work of sculptor Peter Scheemakers, who also designed the monuments for Dryden and Shakespeare in Westminster Abbey. The funeral armour, helmet and shield are part of the heraldic tradition for the funerals of the aristocracy. There may well have been other monuments to members of the Nevill family, now lost. The church tower collapsed on 12 November 1785, causing great destruction and loss. 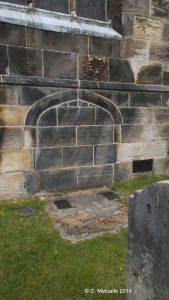 There are 20 members of the Nevill family buried in the Nevill vault under the church, which was in use for a hundred years. Those buried include the William Nevill who was the founder of Kidbrooke and died in 1744, his second wife, Lady Rebecca Nevill, and his mother, Hannah Nevill, who died in 1764, aged 96, having been a widow for 63 years. 3 daughters by his second marriage died in their 20s: The Hon. Mary Nevill, aged 22 in 1758, The Hon. 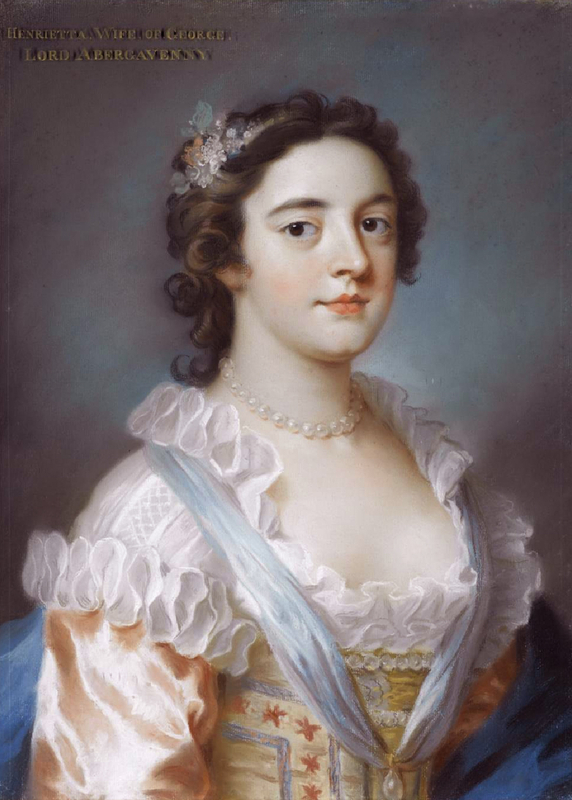 Sophia Nevill, aged 21 in 1759, and the Hon. Harriet Nevill aged 28 in 1762. His daughter by his first marriage, however, The Hon. Catherine Nevill, died unmarried aged 92, in 1820. 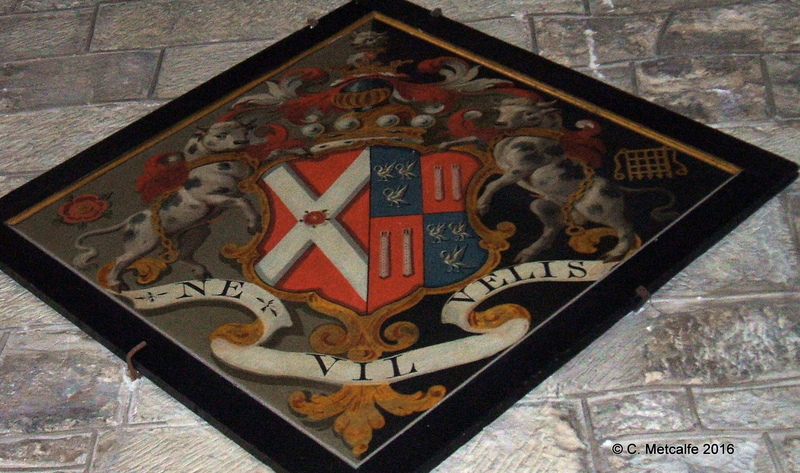 George Nevill and his wife Henrietta Pelham are the couple represented by the hatchment. George Nevill was Lord Lieutenant of Sussex and became Earl of Abergavenny and Viscount Nevill in 1784. He died the next year. The couple had 3 children: Henry Nevill, 2nd earl of Abergavenny (1755-1843); Lady Henrietta Nevill (1756-1833) and The Rev. Hon. George Henry Nevill (1760-1844). The Nevill family moved from Birling in Kent to Kidbrooke, where they lived until 1805. Then they moved back to Eridge castle, one of their ancestral homes which had been rebuilt. Kidbrooke was sold to the Right Hon. Charles Abbot, Speaker of the House of Commons for 15 years. 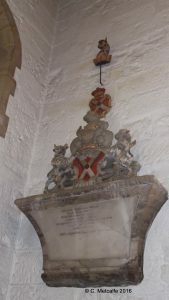 His plain memorial tablet hangs just under the Nevill funeral hatchment. The Nevill funeral hatchment has links with at least one other monument, with 20 bodies in the vault under the church, also to Kidbrooke, to Eridge, and right back to the 14th century and the love story of John of Gaunt and Katherine Swynford- so there is a lot to think about next time you look up at the words ‘Ne Vil Velis’ and the various heraldic symbols.